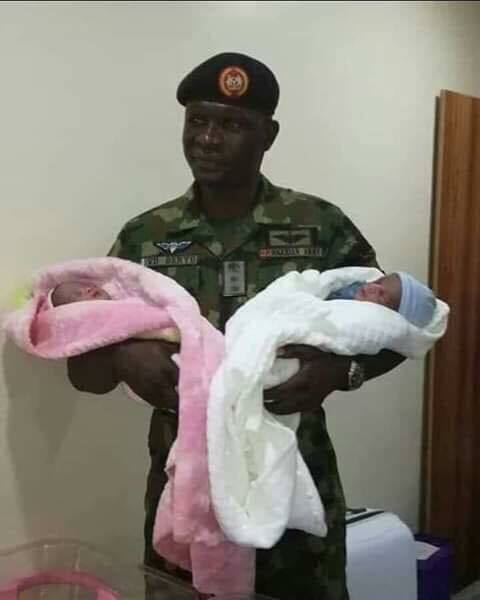 Home Current Affairs PHOTO NEWS: Meet Army Officer Who Got A Set Of Twins After 12 Years Of Waiting On God. PHOTO NEWS: Meet Army Officer Who Got A Set Of Twins After 12 Years Of Waiting On God. Col. Victor Beryo with his kids. An officer of the Nigerian Army, Colonel Victor Beryo has just been blessed by God with a set of twins after 12 years of waiting on the Lord. The very elated officer is seen here carrying his babies, rejoicing and showcasing his bundle of joy to the world.